Ok, I pushed myself on this one. 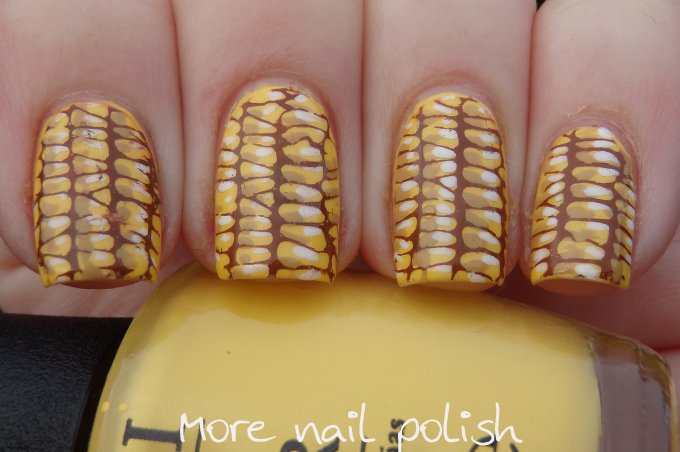 No stamping here today, all freehand. I think this mani proves the point as to why I prefer stamping, because I sure ain't no artist when it comes to painting on tiny nail sized canvases. I was thinking of what design I should do and started thinking about things that are yellow. Bananas... nah, I need to move away from the fruit theme with the picnic basket then oranges, bananas would have been a bit much. 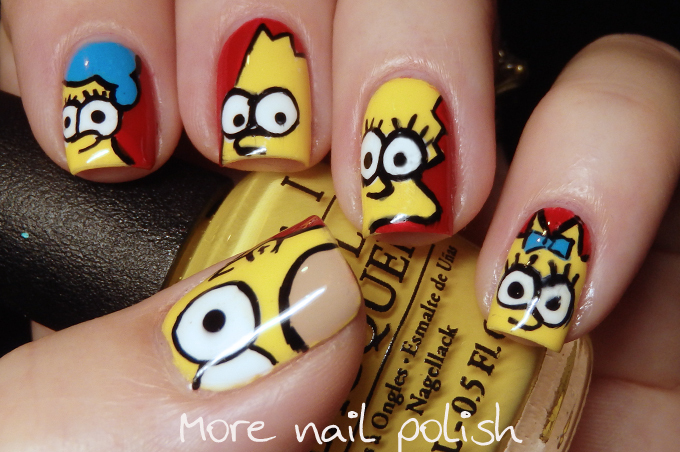 Minions... nah everyone does Minions nails, even though I haven't. Lego mini figures... ooh maybe, they would be pretty easy to paint. 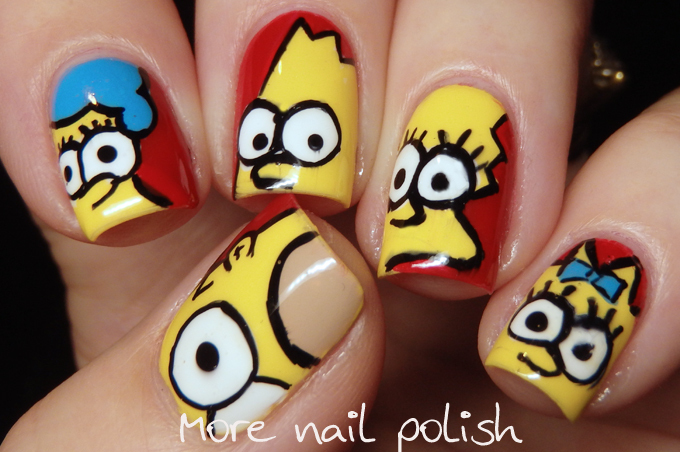 Simpsons... sure I love The Simpsons and I can totally pull that off!! Ha! I was inspired by the designs done my Polish Art Addict (I used to read Leslie's blog all the time and it's sad she has stopped blogging this year). 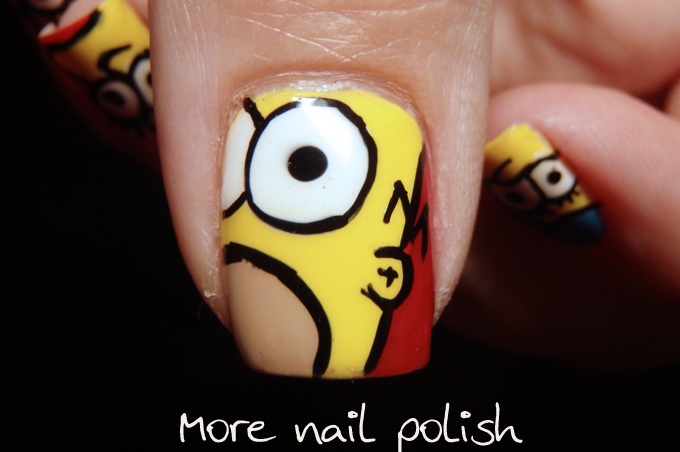 The big difference is that she painted hers with acrylic paint and I did this all with nail polish (plus her's are actually really good and mine are pretty crap - except for Homer, I'm happy with how he came out). I'm all kinda pissed at myself that I forgot to photograph my right hand. It was damn funny to see my attempt at this same design painted with my left hand. Although I could see some serious improvement with my brush control and that I'm definitely improving with my left hand. 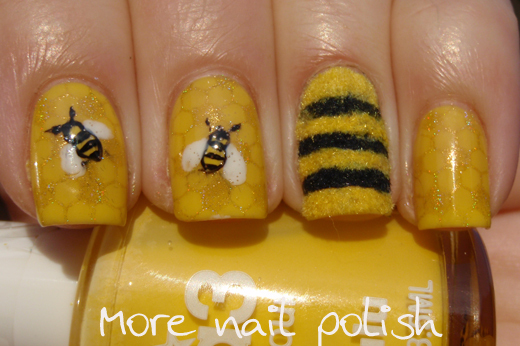 The yellow polish is OPI I can't cope-a-cabana. Red is OPI Big apple red and blue is OPI No room for the blues. Time to move away from the freehand work me thinks! My Yellow nails from 2013 and 2014! 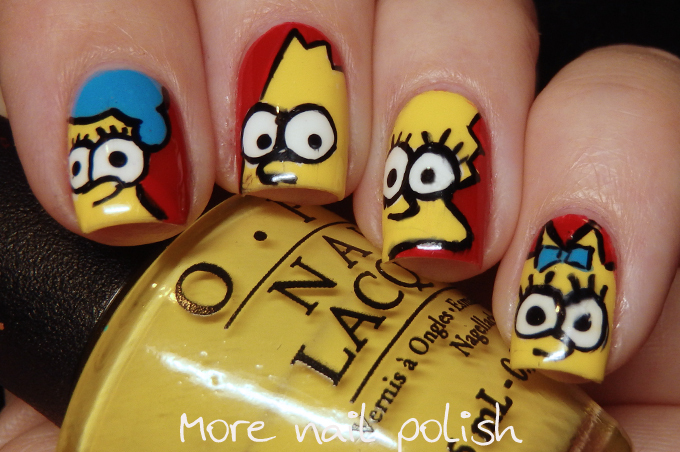 What a great mani. It put a happy big smile on my face. Omg these are amazing! I don't know what you're talking about.. you're great at freehand! The Simpsons was genius! Love this. I would hardly call these crap! They came out so cute! These are great! I think your freehand skills are much better than you give yourself credit for.